The single greatest lesson the garden teaches is that our relationship to the planet need not be zero-sum, and that as long as the sun still shines and people still can plan and plant, think and do, we can, if we bother to try, find ways to provide for ourselves without diminishing the world. 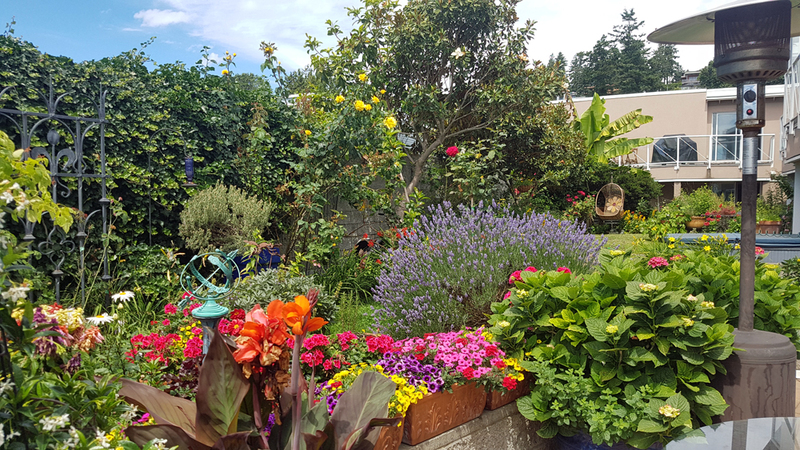 In all the years I lived in my parent’s house, I was a garden slave. My father had back problems and wasn’t able to do heavy work. 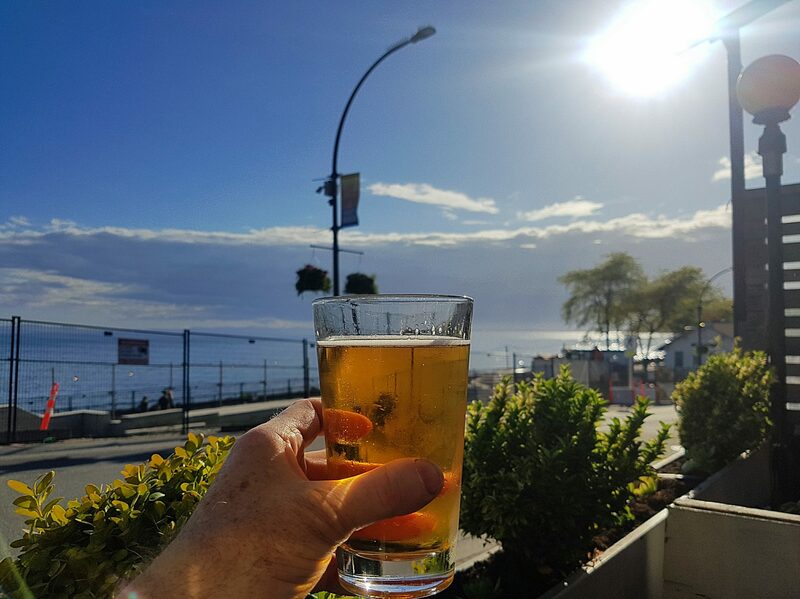 Throw in the fact that I’m the size of a moose and while poorly inclined to manual labour, was capable of it if pressed, and I spent part of every summer adding endless loads of sand and peat moss to the leaden clay soil of our backyard, digging and shoveling. When I left home I swore I’d never pick up a shovel in anger again. Gardening? Bah, that’s for chumps. 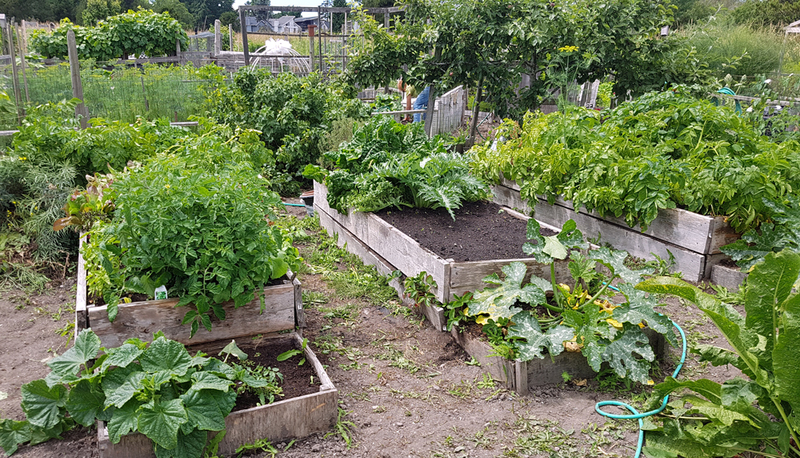 So, when I settled down in White Rock the very first thing I did was get a community garden plot and set to digging and shoveling. Community Garden at Blackie Spit, 17 years on. Gardening doesn’t just get under your fingernails, it gets into your soul. Every year I learn something new, every person I meet in the gardens tells me something important, every season brings challenges and surprises, and wonder of wonders, I really enjoy digging and shoveling. Go figure. I did take away some lessons from enforced servitude at my parent’s plot: after a few years of amending the heavy clay of my community plot I gave up: even 10 cubic metres of peat and sand didn’t leaven the brick-hard yellowish clay (probably stratified clay related to the Puyallup Interglacial deposits all around the Lower Mainland) so I built boxes and filled them with light, airy topsoil, so friable and free-running it’s like cake mix. It was after that that I made real progress growing crucifers, carrots, peas, tomatoes, potatoes, herbs, lettuces, rhubarb, artichokes, berries, apples, et cetera. One of the things I’ve learned in the last few years is recognising that not everything you didn’t plant is a weed, and not all weeds are pests. A case in point is purslane. For a decade I cursed the stupid weed, having made the mistake of rototilling it to get rid of it. It can root from a stem, and torn-off stems can remain viable for decades, so a rototiller is the best way to spread it. Oy. A few year’s back a friend of mine was looking at my garden and openly admired my purslane. When I goggled at this, he goggled right back and asked why I wasn’t harvesting it for the table. Cue the light-bulb: not only did I not have to weed it anymore, I could just go ahead and eat it. That’s my kind of weed. 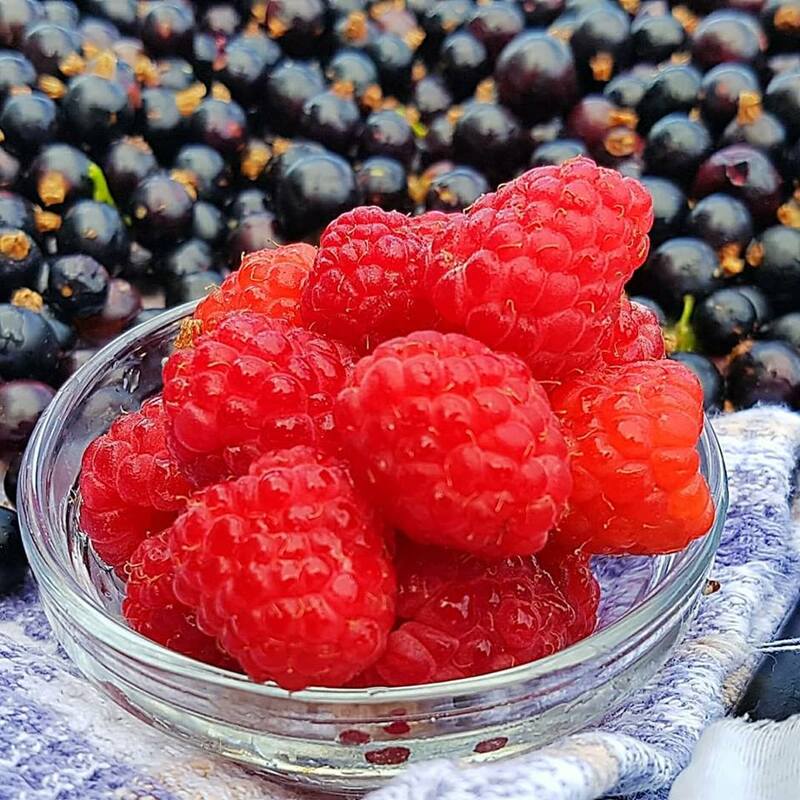 It’s lightly tart, a bit like sorrel that way, and is a rich source of omega-3 oils, as well as a polysaccharide character–that means it’s kind of slimy, but in the same way that okra is, providing a lot of soluble dietary fibre. 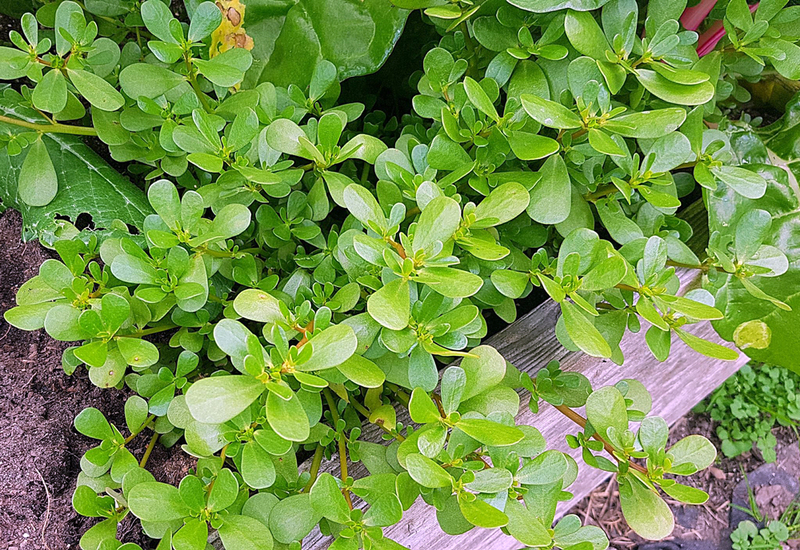 It wasn’t long before I was tossing purslane into salads and stir fries, and I began looking around for other ways to use it. 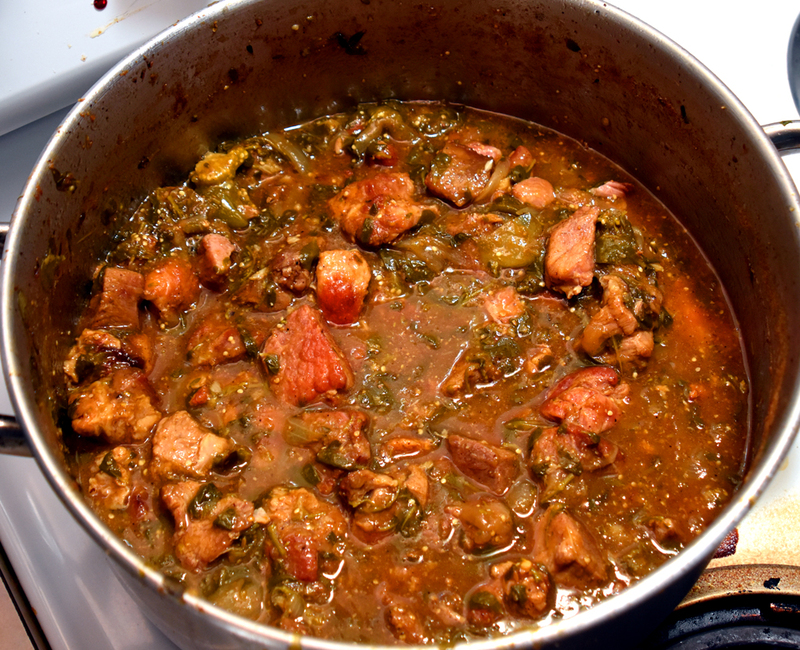 One of the dishes is a pork and purslane stew with tomatillos. It was a recipe I found in Taunton’s Fine Cooking magazine, but as with any recipe I ignored the fine print and applied my own cooking preferences to it. It may not be authentic to the original Mexican cook who made it, but it’s a big hit around Chaos Manor. 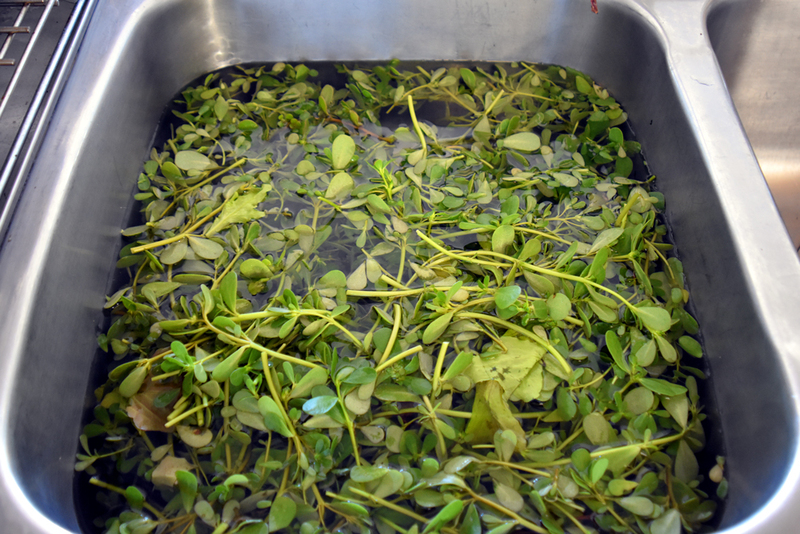 Step one is to harvest and wash the purslane, and then pick it over. You want mostly the leaves, and the tender little stems near the tip of the plant. You can eat the thicker stems, but they’re a little woody and tend to be bitter. Step two is to get a big honkin’ pork shoulder roast. It needs to be nice and fatty. 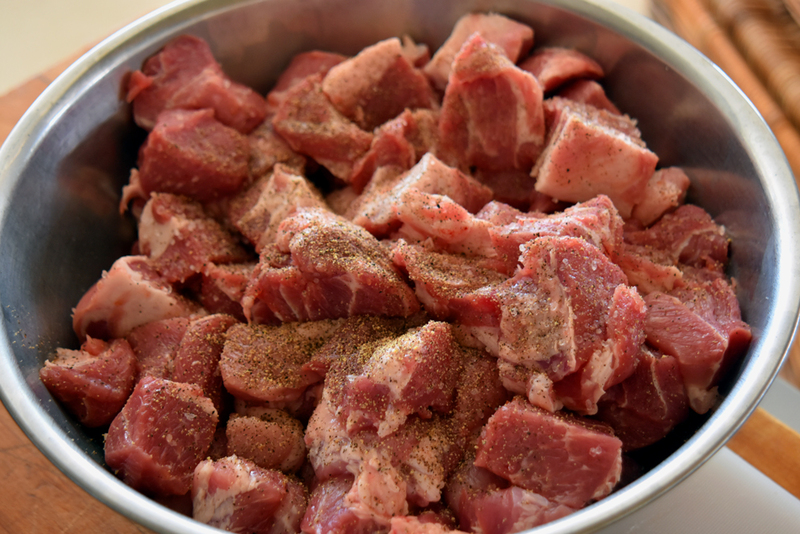 Seriously people, stop eating so much lean pork. It doesn’t have good texture and it’s nearly as bland as chicken breast when it’s too lean. Fat is where the flavour and the fat-soluble nutrients are, and eating fat is really good for you. 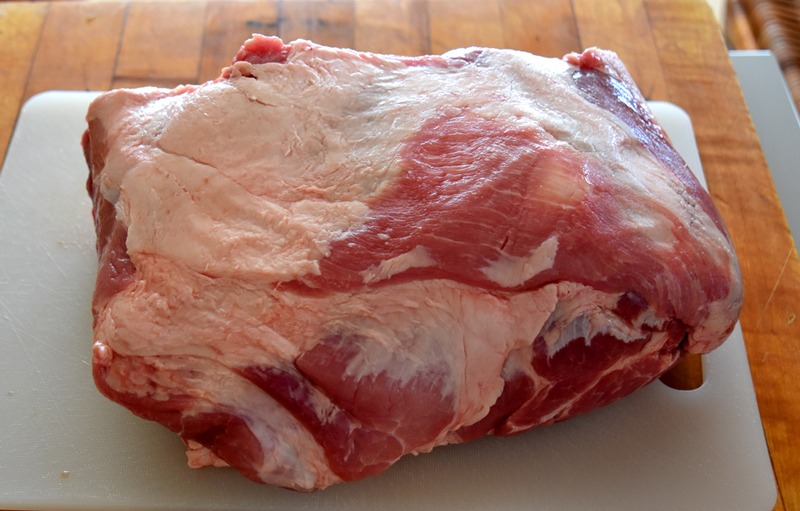 I found a nice-looking four-pounder at my butcher and proceeded to chunk it up in 1.5 inch cubes. Salt and pepper go together like . . . a mineral and a dried berry? 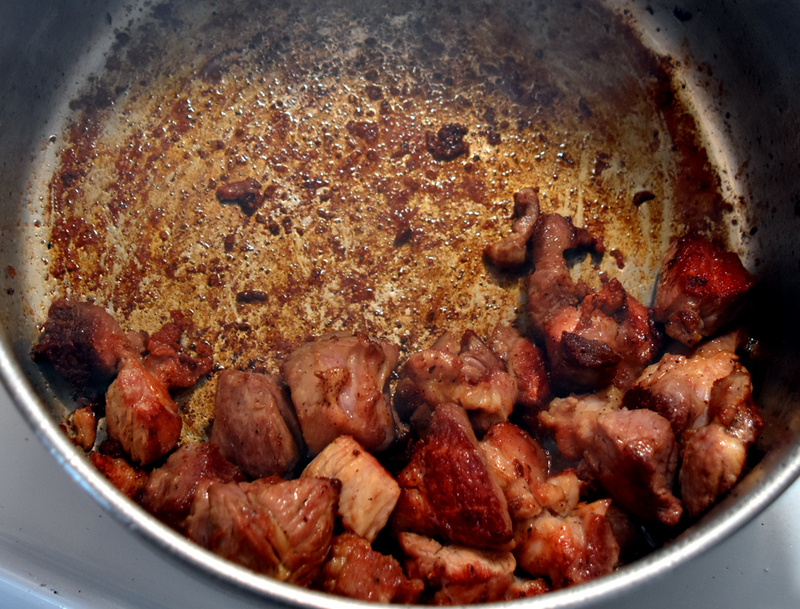 I got a pan smoking hot, tossed the pork cubes with a generous coating of salt and pepper and proceeded to brown it off in small batches. 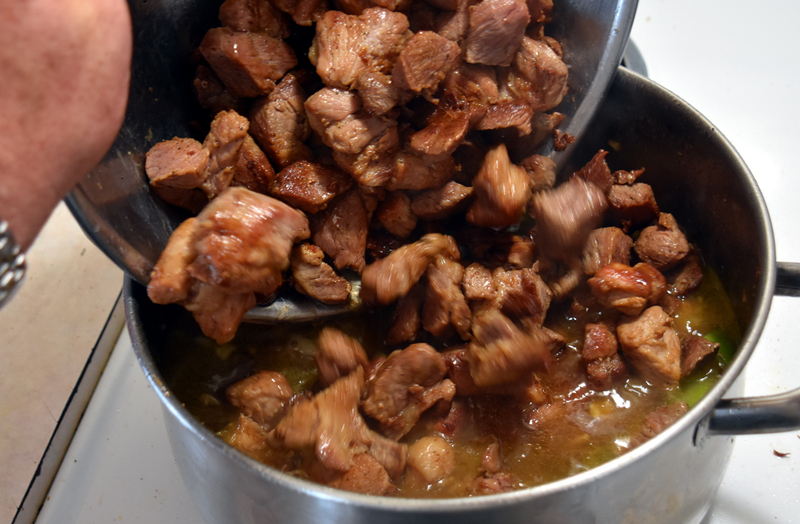 The trick to getting good flavour out a cut of meat is to brown it well, developing all the richness that Maillard reactions (caramelizing, sort-of) bring to it. That brown goo on the bottom of the pot is rich, tawny gold. The French call it ‘fond’ and it’s the basis for a deeply meaty experience. Don’t waste a speck of it. While I was browning off the pork I assembled the usual suspects for this dish. I was in great good luck the day I decided to make this dish: my local greengrocer had fresh tomatillos in stock, for the first time this year. I even had to explain to the nice-but-terribly-young lady at the checkout what they were. No matter, she was truly interested in what the weird old man was cooking up this time. Medium slices: they’re going to cook down to nothing anyway. 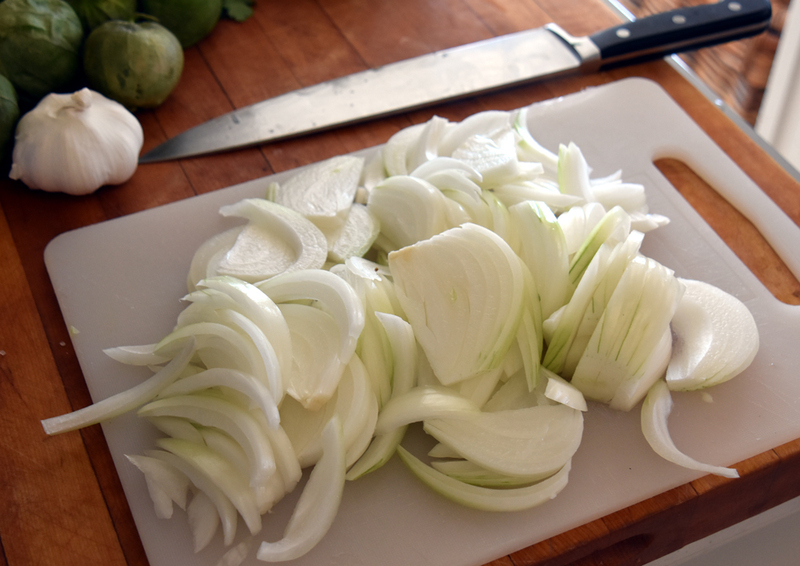 Onions get sliced up, and the garlic gets finely diced. Because I brown the hell out of my onions (more below) I saved the garlic aside to add after they were done, because garlic gets bitter if it’s the least bit burnt. I cooked the onions until they were dark brown and completely soft, using the liquid that came out of them to loosen the fond off of the bottom of the pot and bring it to the party. 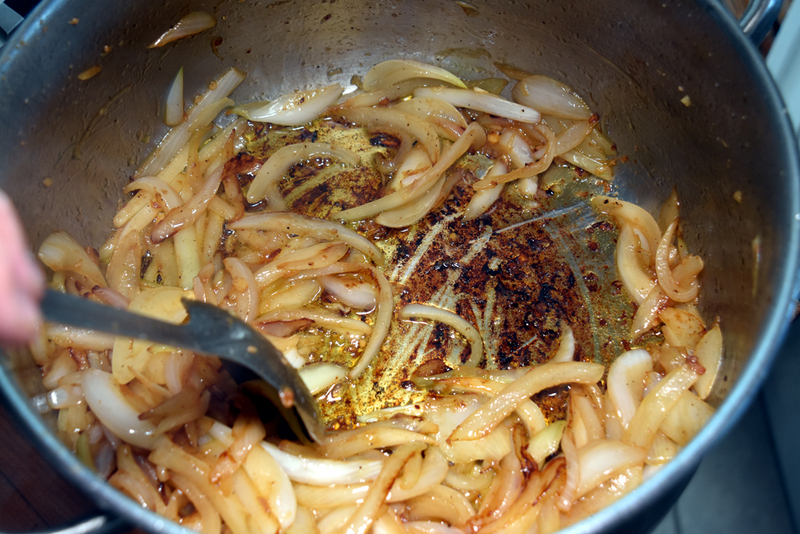 The sugars in the onion will caramelize a long, long way and you can cook the living whee out of them and they’ll add more depth and colour to the stew. 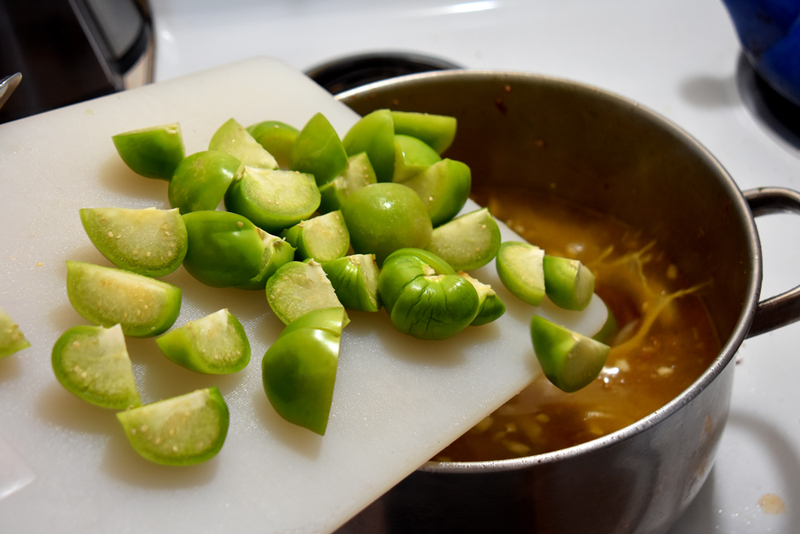 While the onions were cooking way, way down I de-papered and washed the tomatillos. 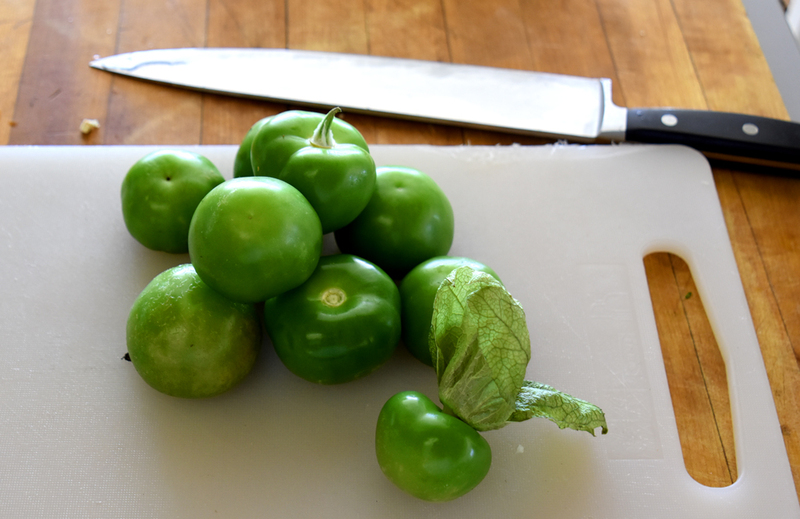 They do look like a really green tomato, but they’re quite different. the flesh is much firmer and less watery, and they’re more citrusy and resiny-sappy than even the greenest tomato. I rarely have less than three gallons of chicken stock on hand. One never can predict chicken-related emergencies. 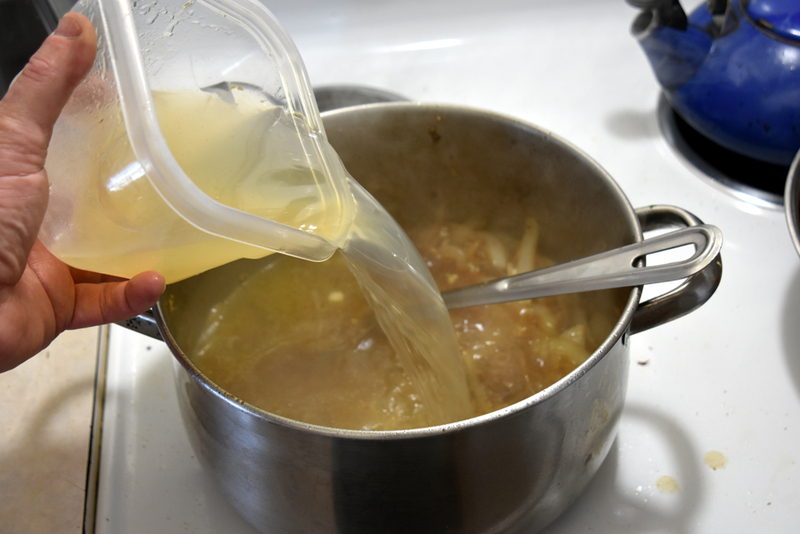 When the onions had fully submitted to my will, I added about a litre of homemade chicken stock. Getting homemade chickens is the hardest part of making it. I scraped and stirred to make sure the pot was fully deglazed. With the heat turned to high I slid in the tomatillos and (not shown) the chopped garlic and the toasted and ground cumin. I added the pork back. I tasted a few pieces and seriously? I could have sat with a fork and a little hot sauce and eaten a pound of that pork, it was so crispy from the fat being well-browned. I could tell even before cooking this was really going to come together. You can see in this picture that the purslane has been relieved of thick stems and nicely cleaned up. 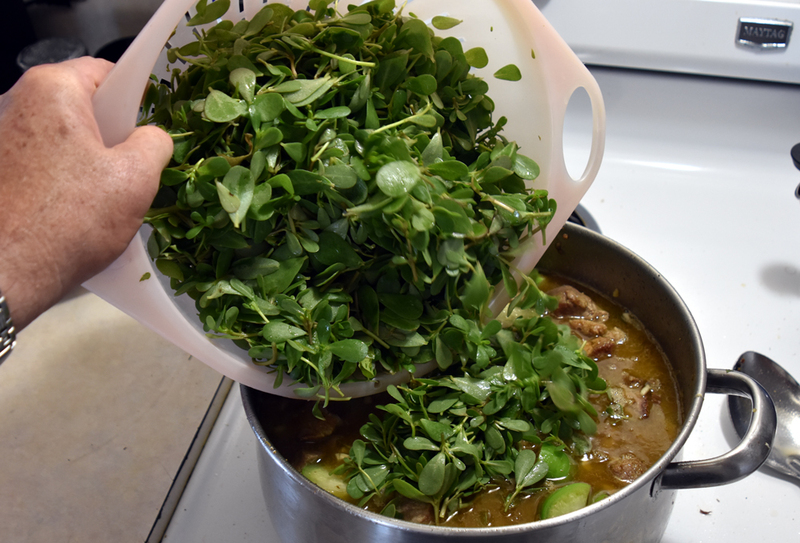 The pot is getting full, but the purslane will cook down and I was planning on boiling off at least 1/3 of the volume. 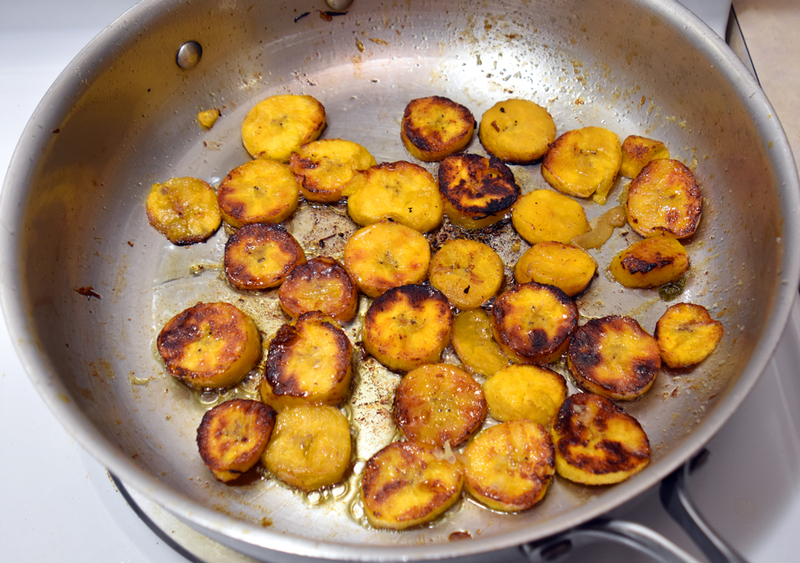 Plantains are the grown-up of bananas, kind of starchy and boring unless you know how to spice them up. While the stew was cooking down I put on a pot of rice and prepped plantains. They’re kind of a cross between an actual banana and a starchy vegetable. 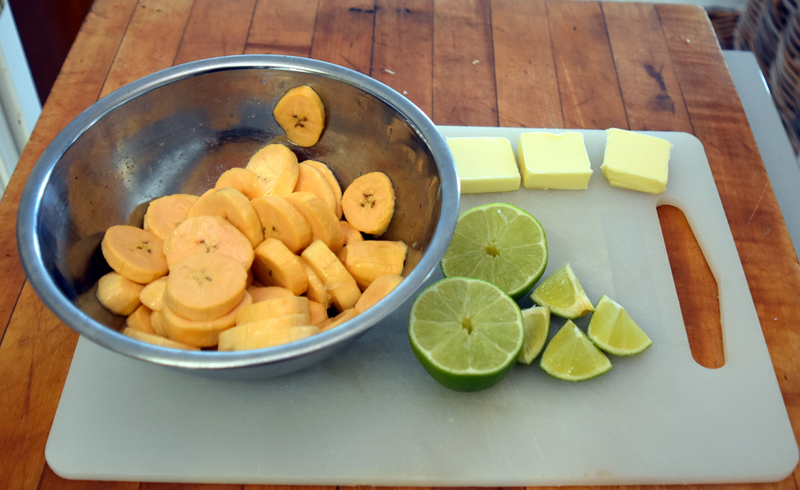 Fried in butter and hit with salt, a little brown sugar and some lime juice, they’re really tasty. I usually add some allspice and nutmeg and chopped Scotch Bonnet pepper, but this stew is Mexican (ostensibly) not Jamaican, so I held off. 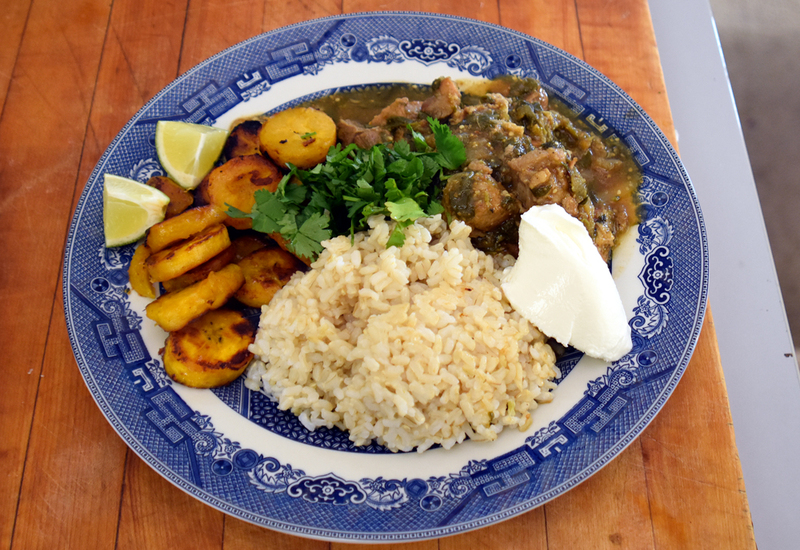 Once the plantains were planted in the pan, it was time to check on the stew. It had reduced to a wonderfully deep and rich stew, thickened by the purslane. The flavours are complex, but clear. I have a bug about dishes with too many non-complimentary or non-contrasting/counterpointing elements. They seem muddy to me. 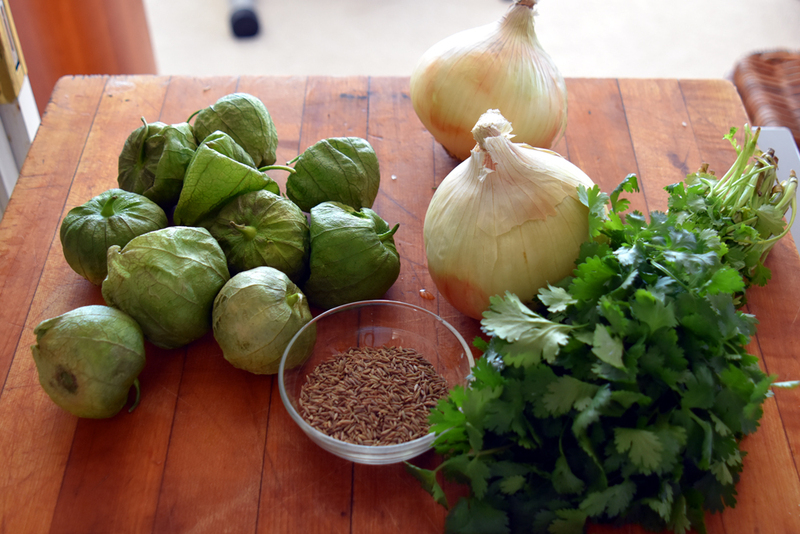 This stew has the richness and savoury development of the pork cut by the acidity of the tomatillos and the purslane with a bit of a bass note from the cumin and sweetness from the onions, pretty much the way I like my flavour profiles. Yes, it’s a hearty portion, but I was in the garden all day! A handful of chopped cilantro, a squeeze of lime, a daub of thick yogurt and a dab of habanero sauce and it was a little bit of heaven. There’s enough leftover to freeze for future meals, and I put a bit aside for Hot Tub and Nacho Night. It will make a great topping for nachos, with the addition of some pickled jalapenos to spice it up. That was the meal that was. Now that I’m back to freelancing again (need a brilliant copywriter? Shoot me an email. I also do education, brand championship, marketing, strategic consulting, and promotions. Let’s talk.) I’ll have time to do more blogging and catch up with some issues and ideas that I have been itching to cover. See you soon.